Along our country lanes and roads, from June to September, this tall (1m), hairy annualo or biennial plant brightens up the hedgerows with its lovely feathery leaves and umbels of flowers. 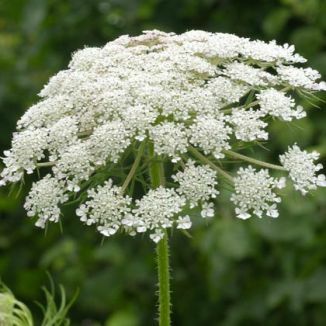 Also known as Queen Anne's Lace on account of the delicacy of the little individual flowers and the feathery divided bracts which surround them. The creamy-white flowers (2-3mm across) are held in broad, flat umbels and the central flower of the umbel is sometimes pink or red. The petals of each little flower are unequal. 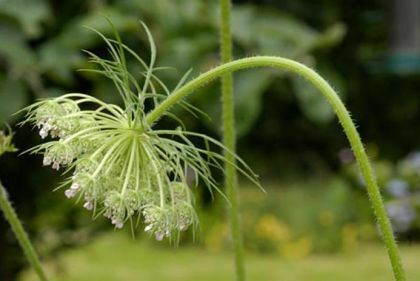 The bracts surrounding the umbel are 3-lobed and showy and they curve upwards, shaping all of the umbel into a cup-like shape when they are in fruit. The leaves are finely cut, bi- or tri-pinnately divided with narrow leaflets. This is a native plant belonging to the family Apiaceae. My first record of this plant is in Co Cavan in 1984 and I took the photographs in Gibletstown, Co Wexford in 2008. This wildflower is also known as 'Bird's nest' because of its shape when in fruit. Handling the leaves of this plant can cause a degree of discomfort to the skin.